Banquet Tables Pro® light up color changing LED products are commercial quality designed for rental companies, bars, nightclubs & more! All of the LED products we manufacture are "RGB", meaning you can change the color up to 20 different colors with the click of a remote control. They can be programmed to flash or change colors as well. We manufacture our LED furniture right here in Tampa, Florida USA. 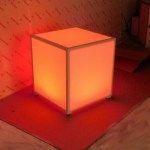 Need custom or wholesale acrylic light up furniture? Give us a call.